Alex Jones has been on a roll lately ever since his news outlet was de-platformed from social media. He’s really been driving home some powerful truths through other mediums, including the fact that Apple is basically now owned by communist China, and is being used as a tool of tech tyranny to silence American journalists. During a recent segment of his show, available at Brighteon.com, Jones explained how the communist Chinese government recently threatened the United States, using Apple as the object of that threat in retaliation against President Donald Trump’s efforts to establish new trade deals that benefit America. While it’s been known for quite some time that Apple produces nearly all of its tech junk in China, most Americans probably assumed that the California-based company was still American. But according to Jones, that’s no longer – and perhaps never was – the case. “People say, well why did you even launch and app on iTunes and Android if they’re going to censor you? Because that’s where the commerce is. That’s where the ideas are. That’s the open marketplace of ideas,” Jones added. It’s no secret that Apple has long taken advantage of cheap Chinese slave labor to produce overpriced iPhones, MacBooks, and other top-dollar Apple gear. But what wasn’t fully revealed at the time was that Apple has been working in lockstep with the communist Chinese government to subvert American interests. “It’s a major national security issue that Apple officially announced five months ago that they’re Chinese communist-run, and they’re helping to censor and control the Chinese people, and the main iCloud keys to the entire planet are now state-run by the Chicoms,” Jones warns. Perhaps things weren’t this bad when Steve Jobs was at the helm. But the late founder of Apple has since been replaced by a homosexual tech tyrant, and an apparent American traitor, who has no qualms with selling American interests down the river in exchange for profit and power. 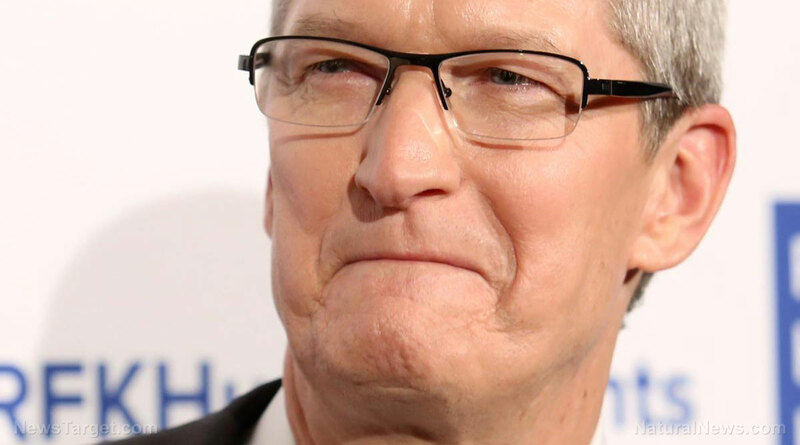 “Tim Cook, who has the most debilitated, horrible factories in the world that he subcontracts with – Foxconn, suicide nets, all of it – he is literally moving to ban us, not just off of the iTunes streams where we were in the top 10, but now our app that we just launched … off and on they don’t even list it,” Jones says. “China runs Apple … the Chinese government is silencing American members of the press,” he adds. What this all illustrates is that President Trump really knows how to draw the rats out of the woodwork. By holding China accountable for abusing trade with the U.S. prior to this presidency, we now have this revelation that Apple is just another soulless, communist-sympathizing, greed-driven multinational corporation pushing the globalist agenda. For more news about tech tyrants like Tim Cook and his Apple empire, be sure to check out Technocrats.news. You can also keep up with the latest concerning Big Tech’s censorship of conservative voices in the run-up to the midterms by visiting Censorship.news.